Date of Birth / Birth Date / Age 2nd Feb, 1987. When we posted this article in 2017, her age is around 30 years. Manasi Naik is a dancer, actress and model who is originally from Pune. Initially, she had ambitions of becoming a doctor, hence she chose the Science stream after her SSC exams. For her education, she headed to the Fergusson College in Pune. In her college days, she was active in the modelling field and appeared on the cover of many magazines. Mana and Mau are her nicknames. Her height is around 5 feet 1 inch. She is also very active on Social media, including Twitter, Instagram and Facebook. Her debut movie was Jabardast, directed by Mahesh Kothare. She also acted in the first few episodes of the TV show – Chala Hawa Yeu Dya. She is an excellent dancer and won the Halla Bol competition, early in her career. She has performed the ‘Baghtoy Rickshwala’ and the ‘Bai Vadyavar Ya’ video which have over 2 million views on Youtube. 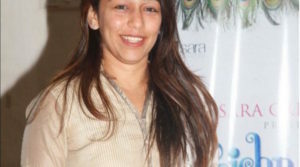 Well known for her item numbers in many marathi films, she has also performed in a number of other events such as Mahotsavs, Film and TV awards shows and social functions. Marriage / Husband / Spouse Currently no confirmed news about her marital status or family is available with us. you autograph and One Selfy pz Reply me . i am looking to launch a bridal collection and have to go or that with you . Best wishesh for ur Happy life…..@prakash. Ek Number….no comments yaar……you are dream girl…. Dear mansi…u r looking very nice. I m ur great fan…long time…ur dance is like me…JABARDUST…. You’ll be the one of the greatest dancer not only in Marathi also in Bollywood. You are the girl who can challenge SHAKIRA … I m ur greatest fan ever since i saw the dance BAHHTOY RIKSHAVALA ..